belongs to the beryl family (Be3Al2(SiO3)6), from Latin: aqua marina, “water of the sea” is a blue variety of beryl. It occurs at most localities which yield ordinary beryl; the pale blue color of aquamarine is attributed to Fe2+. The Fe3+ ions produce golden-yellow color, and when both Fe2+ and Fe3+ are present, the color is a darker blue. According to legend, aquamarine originated in the treasure chest of fabulous mermaids, and has since ancient times, been regarded as ‘the sailor’s lucky stone’. Aquamarine derives its name from the Latin term for seawater and has a long tradition of being a stone for those who spend much of their time at sea. The Greeks and the Romans knew aquamarine as the sailor’s gem too, believing that it ensured a safe and prosperous passage across stormy seas. Legend has it that aquamarines were the prized possessions of many mermaids and would thus protect sailors from the dangers of sea, including warding off sea-sickness. In Antiquity, as well as in the Middle Ages people believed that the cosmos is reflected in gemstones. It is no surprise that aquamarine is assigned to the planet Neptune and is also one of March’s official birthstones. The esoteric movement revived the ancient belief and the gem industry made it another marketing tool to promote certain gems. The healing powers of gems remains a controversial issue, but has been mentioned for centuries by healers, shamans and medicine men. Whether it’s factual or a placebo effect, it truly doesn’t matter as long as it helps people who need it. The best approach is to wear the gemstone in contact with the skin, especially close to the injured or troubled part of the body. Aquamarine is said to be of help for arthritis, eye inflammation, sore throat and varicose veins. 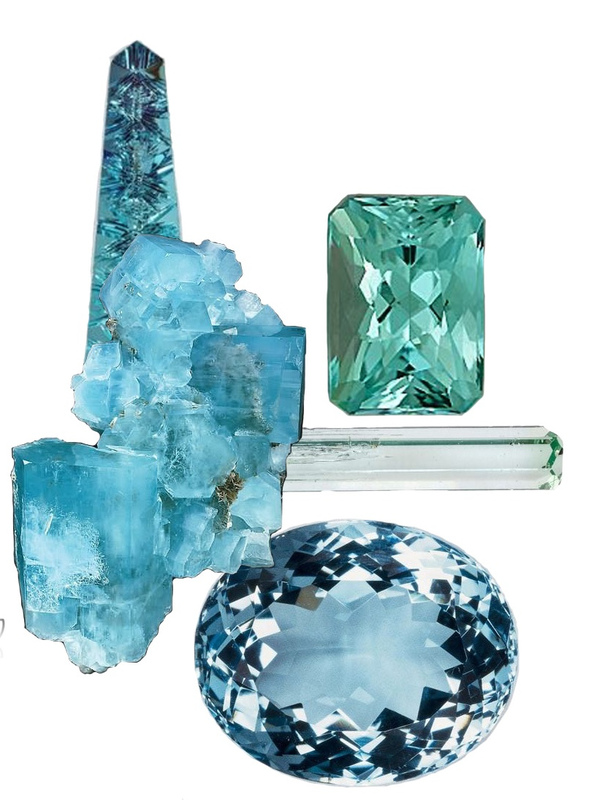 Aquamarine is one of the more durable of gemstones, but it still requires careful handling and care. Avoid wearing aquamarine jewelry when working around harsh chemicals. To prevent scratches, always store aquamarine gemstones separately from other types of gemstone and gemstone jewelry. When cleaning, you can use warm soapy water and dry aquamarine gems and jewelry using tissue or a soft cloth. Be sure to rinse your stones well to ensure all soapy residue is removed. Wrap your stones in a soft cloth when storing them for extended periods of time, or place them into a fabric-lined box.